Weill Hall at Carnegie Hall welcomed our performance the other night. Cellist Alexander Scheirle and percussionist John Ostrowski joined us for this one. It occurred to me that the core of the program was the same as our first performance at the Kennedy Center in 1999. Otherwise, it was basically the program that we’ve been performing in China and in Washington, D.C. over the last couple of years. The Shepherdess, Deep Night, Listen to the Pines, Bach, Kreisler, Spirit of My Erhu were all on that first program. (We could have done the Bartok in 1999 as well, but ran out of time.) 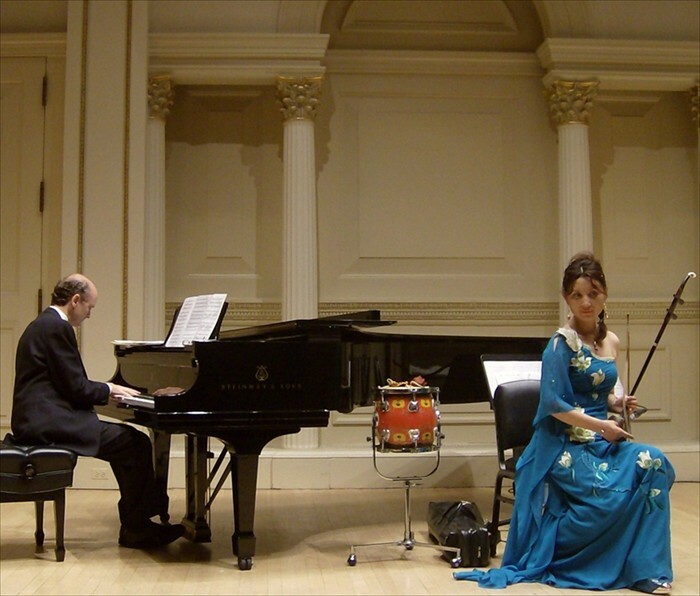 Alexander played a large role in this one, notably in the duets with Ma Xiaohui on Clear Night, and Tan Dun’s Crouching Tiger melody, to say nothing of Mustafa, Adios Noninos of Astor Piazzolla, Horse Race, & Jasmine Flower. The after-concert party took place at China Regency restaurant across the street.